Smash and grabs are not always the best way to illicitly acquire objects in fantasy land. Sometimes these things take planning, a loyal crew, and a little bit of luck. But a good crew can always get the job done. Just a couple of days before the topic for this week’s meme was revealed, I felt like rewatching a couple of episodes from one of my favorite shows, Firefly. For those of you who are not familiar with it, it’s an intriguing mix of science fiction and western themes, and as strange as it might sound, it works perfectly. The premise: in the far future, humanity has spread around the galaxy, colonizing many different planets. After a bloody civil war, these worlds have come under the rule of the Alliance – a bureaucratic, paternalistic form of government caring more for the wealthy central planets than for the outward-lying colonies that are often left to fend for themselves. 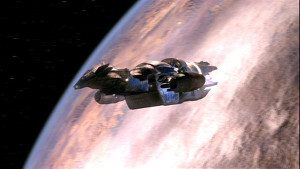 On this background moves the crew of Serenity, a Firefly-class spaceship manned by a band of rogues who refuse to bow to authority and live on the fringes carrying cargoes (both legal and illegal, but especially the latter) and passengers, while trying to elude the Alliance’s patrols. Serendipitously enough, the second episode of this short-lives series (thank you, oh myopic tv executives!) focuses on a heist – the title: The Train Job. Captain Malcom Reynolds and his crew are contacted by crime lord Niska to steal a box from a train, and they are so desperate for income that they are ready to overlook Niska’s reputation for ruthlessness – enhanced by a horrific scene in which he shows our heroes what happens to people who don’t deliver on promises – and to ask no questions about the contents of said box. 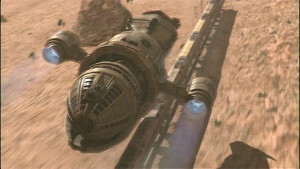 What follows is one of the most fun and thrilling sequences in the show: while Reynolds and his XO Zoe travel on the train to offer inside backing, mercenary Jayne – Serenity’s one-man brawn department – is lowered inside the train on a flying cable, hooks the target crate and is reeled back inside the ship with the prize, while on the train all hell breaks loose due to the unforeseen presence of a contingent of Alliance soldiers on the premises. 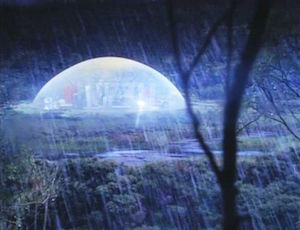 Forced to remain onboard and stick to their assumed identities, the two find themselves at the train’s destination, the mining town of Paradiso (there’s some fine irony here…), where they discover the nature of the stolen cargo: the planet’s terraforming operations have created the breeding ground for a degenerative disease whose only cure was in the box targeted by Niska. Captain Reynolds might be walking on the fine diving line between law and crime, but his conscience will not allow him to profit from the suffering of a whole town, so he gives back the goods to the Paradiso settlers and decides to risk Niska’s retribution – which will come in time, but this is another story…. What matters here is the characterization at the basis of the episode and the whole series: the Serenity gang is made of anti-heroes by definition, and yet they do possess enough moral standards that help shape their decisions in the face of difficult choices. While the train heist is an adventurous caper, liberally dotted with amusing scenes (including the rescue of Reynolds and Zoe by another member of the crew, pretending to be the owner of their indenture contracts) and it fits the classic Western tradition of the train robbery, there are several serious narrative threads that help expand on the future represented by the show and on the psychological makeup of the characters peopling it. 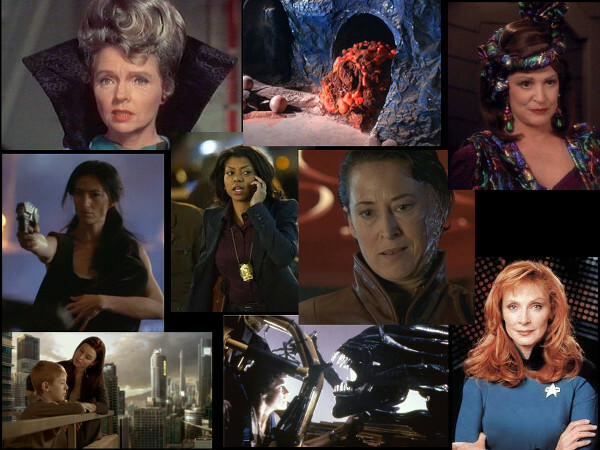 First we have the Alliance, the entity requiring unthinking loyalty from its subjects – some of which give it willingly enough, without considering the deeper ramifications, as shown in the initial bar scene in which the crew ends up in a brawl over Unification Day, the celebration of the Alliance’s victory over the Independents. The contrast between the highly technological Alliance ships on patrol duty, and the dusty, miserable and hopeless landscape of colonies like Paradiso, shows how the unification of the settled worlds was imposed for purely selfish and political reasons, without a second thought for the well-being of the colonists themselves. Then there are organizations like Niska’s, thriving on the power vacuum created by the Alliance’s lack of care, and even overlooked by the central authority as long as they don’t interfere with its goals. In the middle lie the fringe planets, too small and poor to really matter on an economic scale, but still too important for the Alliance’s public face to be allowed any scrap of independence. This is the background in which the Serenity’s crew moves, taking advantage of the central government’s indifference but at the same time following a sort of moral compass that makes it impossible for them to gain from the misfortunes of others. They might be outlaws, swindlers and smugglers, but when push comes to shove the crew demonstrates time and again that their hearts are in the right place, and that’s enough for the audience to root for them – even when they rob a train…. There is nothing more terrifying, as far as god-like beings are concerned, than the pantheon envisioned by H.P. 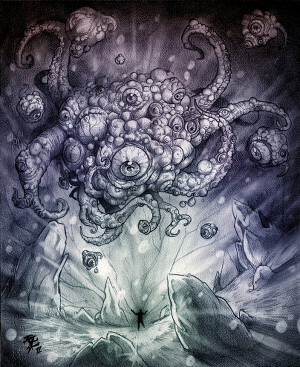 Lovecraft: his Old Ones, who ruled the Earth in ancient, forgotten times, and who at present seem to have succumbed to a death-like sleep, never cared for humanity, its destiny or the calamities visited upon mankind. 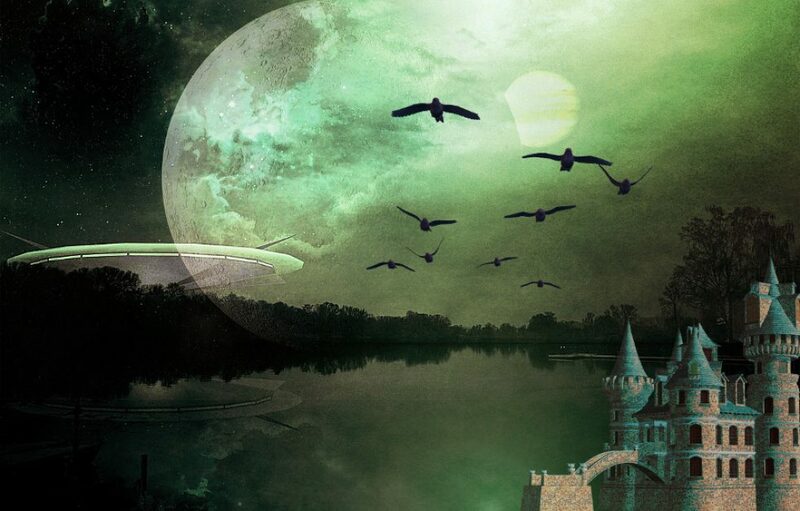 They are not gods in the strictest sense of the word, but rather extraterrestrial or extra-dimensional beings, often remote, distantly cruel and unfeeling, which makes them even more frightening than actively evil creatures. Some humans chose to worship them, mistaking them for gods and creating weird and terrifying cults around them: these people wait – and pray – for the Old Ones’ release from their slumber and the advent of a new age of chaos. 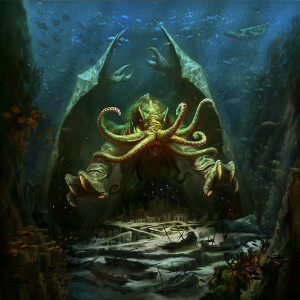 The most (in)famous is CTHULHU, a god from a different dimension: a water-bound creature, roughly humanoid but also many-tentacled and greenish in color. Huge and powerful, he’s said to be in telepathic communication with his worshippers/priests even though he’s asleep in the depths of the subterranean city of R’yleth. His followers believe he will one day rise from his slumber and retake the rule of Earth, annihilating everything that’s good and wholesome: only a spell from the Necronomicon, the lost book of dark lore that Lovecraft often quotes, might have the power to stop him. 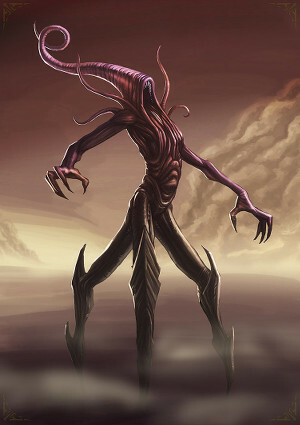 NYARLATHOTEP goes by the moniker “The Crawling Chaos” and is known for his evil disposition and the fact that, unlike his brethren, he still walks the Earth wearing a human being’s appearance. Deception and manipulation are his preferred tools, as is misdirection: contrary to the other gods, who are supremely indifferent to the fate of the human race, he has an active – if evil – interest in their affairs. Less known, but not less powerful or dangerous is AZATHOT: his other names are Demon Sultan or Blind Idiot God – this latter probably comes from his un-intentional creation of the universe at whose center he sits, looking like a churning mass of tentacles of enormous size. With these creatures I needed images that would render justice to H.P. 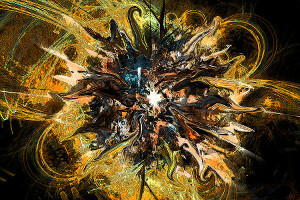 Lovecraft’s imagination, so I turned to Deviantart, a place of rich and amazing creativity. My thanks to all of them for the beautiful art I found on their pages. The original series offers us a very unusual kind of mother with the Horta, a silicon-based creature that’s mistaken for a dangerous monster only because she attacks the miners who are threatening her large cache of eggs, the future generation of her species. Dr. Beverly Crusher, from the Next Generation, is a mother both in the strictest sense of the word and in a more general meaning, being tasked with the crew’s health and well-being. On the other hand, Lwaxana Troi is the kind of parent everyone dreads: strong-willed, unashamedly meddlesome and bound to speak her mind at the drop of a hat – that is, when she is not picking yours through telepathy! In the movie Aliens we see two formidable mothers square off against each other: on one side there’s Ellen Ripley, the heroine of the first movie, a woman who can battle her fears and go straight down to the monsters’ dens to retrieve the child she’s grown attached to. 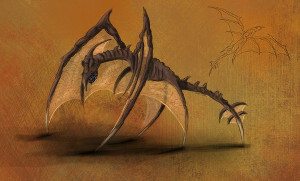 Even though young Newt is not strictly her daughter, Ripley fights for her facing the Alien Queen: this monstrous creature defends her eggs with a mother’s courage, and even though the metamorphs have been depicted by the movies as dangerous, predatory critters that use people as incubators, it’s impossible not to understand the Queen’s scream of impotent rage when Ripley destroys her nest and torches everything both in self-defense and vengeance. Motherhood can be a curse as well, as Xhalax Sun from Farscape learns at her own expense: having conceived her daughter Aeryn through an unsanctioned liaison, she has to decide between the life of her child or that of her lover, and therefore is forced to kill the latter to regain her superiors’ trust. The long, hard way back has scarred her in body and mind, and when she meets her daughter again she’s so full of anger and self-loathing that all she wants is to exact some payback on her offspring. When Aeryn Sun becomes a mother herself she goes on a totally different path, though: the fierceness learned as a warrior goes toward the protection of her child, both when it’s almost removed from her because of its precious DNA and when the boy is born, in the midst of a heated battle. Fighting enemies even during the pain of labor (because, as she herself says, shooting makes her feel better) she proceeds to help herself and her friends out of a tight situation by wielding a gun with one hand and holding on to her baby with the other. Give her a prize for Best Fighter Mom Ever! 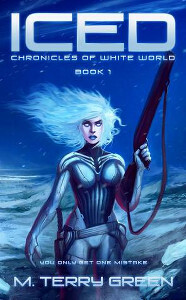 When Kiera Cameron (Continuum), a 2077 City Protective Services officer, is sent back in time to what is our present, all she can think of is going back to her time, and her family: not so much, in my opinion, to a shifty and philandering husband, but to her young son, the only person she focuses on when the going gets though. Highly trained and enhanced with biotech, Kiera is an interesting blend of professional efficiency and understandable weakness, especially where her son is concerned: two of her most prized possessions are a piece of the time device that sent her back and a toy soldier given to her by her son, to keep her safe, and I’ve always thought that the toy is the most important one to her. Alastair Reynold’s Chasm City is one of the most intriguing (and scary) places in SF literature: enclosed by a dome that protects it from the methane atmosphere of Yellowstone, it used to represent the highest peak of human civilization, a place of culture and scientific achievement totally based on nanotechnology. But it all came to an end when the Melding Plague hit, a cyber virus that targeted nanotech-based constructs and destroyed Chasm City’s from the inside out, acting as a disease and attacking both buildings and computers as well as people with implants. The Plague tries to meld organic material and nanotech with unstoppable, horrifying results that have forced the city’s inhabitants to revert to technological levels low enough as to be unaffected by it: Chasm City has become a place where the only art form is that of survival and where the slowly morphing buildings can either be things of wonder or deadly traps. The lowest levels, named The Mulch, house the poor, the desperate and those fleeing from the law, while the wealthier inhabitants dwell in the highest reaches of the Mosquito Net, from which they descend only for the Game, a hunt for human prey devised by the city aristocracy, such as it is, against jaded boredom. Blade Runner offers a vision of 2019 Los Angeles that has become iconic: our first view of it is that of a place of darkness and flames, searchlights and constant rain, giant billboards advertising products and a low-hanging smog cloud lit with infernal red from below. The spectacle offered by ground level is not much better: the rain beats mercilessly on milling crowds that scurry in perpetual haste through the grimy streets where the sun never seems to shine, as if perpetual night had fallen on planet Earth. This city seems to be split in two halves: the street level, with its flowing humanity, shops selling and buying everything, seedy nightclubs and a fair share of criminal activity; and the high-rises, like the one housing the Tyrell Corporation, that seem to float above it all – the only places where a feeble sun seems to make its way through the clouds. It’s a dismal and dangerous place, indeed, but it’s a fascinating one as well, and it has inspired many similar cities in dystopian landscapes. 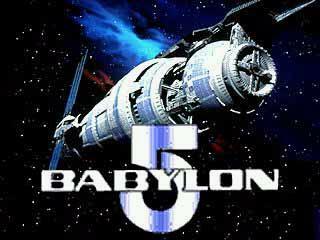 If you never visited it… well, do so because after all…Sooner or later, everyone comes to Babylon 5. 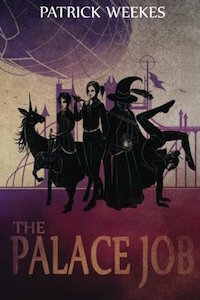 One of the most amazing and unusual magical concepts I encountered until now belongs to Daniel Abraham’s LONG PRICE QUARTET: in the fantasy world he created, magic is literally embodied by the andats. They are concepts, thoughts, ideas, that have been given substance and humanoid form by specially trained “poets” who undergo a rigorous training (rigorous and more often than not brutal) to be able to forge these creatures out of ideas – one might say out of thin air, really – and bind them to their will. The problem with andats is that like the concepts they represent they should not be held in thrall, and therefore these creatures are constantly trying to escape their bonds, to find a loophole in the poet’s lexicon – or a momentary distraction in the concentration that must be always maintained to keep the andat confined – that will allow them to terminate what amounts to slavery. 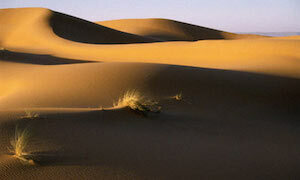 A slavery that could go on forever, since a poet can hand over his andat to another poet. Andats are not just resentful – they are dangerous: for example Seedless, that was created to separate precious cotton from the rest of the plant, is also able to effect miscarriages; or Stone-Made-Soft, that can make a miner’s work so much easier, but can cause the collapse of a tunnel and kill everyone. This is what a poet must always fight against in what amounts to a life-long struggle to control one’s own creation, and the failures are nothing short of catastrophic, as some of the stories related in the novel show with chilling certainty. 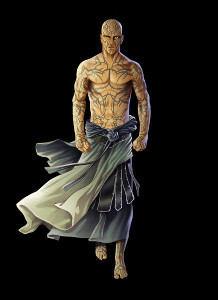 One day though, a lone traveler discovers that painting wards on his skin gives him protection against the demons, and etching them on his weapons allows him to destroy them, so he tattoos those wards all over his skin, becoming the Painted Man (or the Warded Man) and he becomes something of a legend because he can travel at night without fear of the corelings and can bring the fight to them instead of huddling in fear behind four walls. A word about the images: on Peter Brett’s site I chose two among many wonderful images inspired by his books, and since it’s only proper to give talented artists their dues, the image of the Warded man comes from JAH42 on Deviant Art and the weirdly compelling image of the demon comes from chari-san again on Deviant Art. Once more I am amazed at the amount of talent I find on that site. And that’s another awesome display of magic, for me.